Looking to get into tent camping? Having difficulty deciding what to do or get? You've made an excellent choice in recreating. Choose from hundreds of National Parks, the most beautiful undeveloped wilderness areas that have been set aside for us by our ancestors. 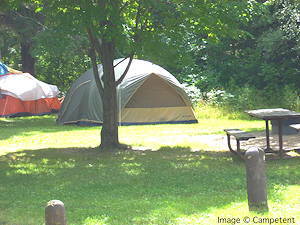 States have followed suit, setting aside State Parks, Forests, and Scenic Trails for your camping and hiking enjoyment. Let Campetent guide you in the quest of finding a tent, gear, campgrounds and in learning the skills of family tent camping. Browse scores of Campetent articles offering insight into various aspects of tent camping. In-depth information found nowhere else on the Internet will reward novice campers with the know-how needed to thoroughly enjoy camping and to assist others with this satisfying form of recreation. Use this Campetent Tent Guide to sort tents according to features and ability to resist weather and to find the best type of tent for your region and camping needs. Once familiar with the info on the page, you will be able to confidently pick a suitable tent for your family. Have a look through the pages of tent brands listed in the navigation buttons to the right. Beyond features, each Campetent tent review also details the layout of the tent so that you can determine if it will appeal to you and your family. Want an easy way to estimate the effect of wind on a tent or a camping trip? The Campetent Grand Wind Scale will increase your confidence in the outdoors while tent camping. You will also learn that a sheltered, forested campsite blocks the majority of winds, allowing a family to camp without concern in a fairly stiff breeze. Family camping is probably the best way, bar none, for families to bond. Children are naturally attracted to campgrounds and wilderness, which stimulate their imagination and wonder. The great outdoors offers children a playground and a classroom that schools cannot provide. Children also become very attached to tents and other camping equipment over time. Teens can bring a friend and pitch a separate tent to enjoy the outdoors at their level of independence. They will be exposed to many things that they do not experience at home or school and will build memories to share with their friends and classmates. Car camping, or base camping, as it is currently known by the up and coming, allows you and your family to bring enough equipment to thoroughly enjoy your time in the wilderness. Experience the outdoors in relative comfort and share those experiences and a warm beverage around the campfire with fellow campers. Your tent camping experiences will remain with you and your family for life. You'll be talking about them decades from now. When most of your everyday life has been forgotten, your time in a tent will still be the topic of many conversations. You'll find yourself sitting at your work desk eagerly anticipating your next camping trip. Feel your worries fade as the city recedes in your rear-view mirror and you escape the rush of city life. Feel your family's excitement grow as you approach the campground. Make new friends. Enjoy the wide open spaces. Relax in the wilderness. Enjoy a romantic night under the stars with a friend. Enjoy hiking in the forests and mountains. Don't have enough money to travel the world? Explore the world in your backyard. People come from all over the world to explore the US wilderness and stay at our campgrounds.